Some people asked AzhwAr “You are abusing rudhra and other celestial entities by calling them as pollAdha dhEvarai. But SAsthras consider your emperumAn also as a dhEva, upEndhra, the brother of indhra and as one among brahmA, vishNu and rudhra, again as a dhEva among the other two primary dhEvas and as being controlled by other dhEvas. Wouldn’t these faults encumber him?” AzhwAr ridicules them saying “All the SAsthras which you people learnt are a waste since you do not know that the one who is in the form of upEndhra and as vishNu is none other than SrIman nArAyaNa who pervades everyone and everything as sarvAntharyAmi”. kaRkinRadhu ellAm kadai – all the education that they have had is very lowly. dhEvarAy niRkum aththEvum – Making the people of this world astonished saying “He (emperumAn) is one among the twelve Adhithyas and indhra”, he remained as one among the Adhithyas and as upEndhra, the younger brother of indhra (lord of celestial entities), also with the name of vAmana (dwarf). AzhwAr reminisces the way emperumAn incarnated as one among dhEvas. There are also those who construe the meaning for this as “Being the antharyAmi (indwelling soul) of dhEvas”. However, since later in the pAsuram AzhwAr is going to say “yAvarAy niRkinRadhellAm” and since mentioning about upEndhra ahead of vishNu as in the line “mUvarAy niRkum mudhupuNarppum” is more apt, and since the flow is better this way, it is better to construe this as referring to upEndhra. aththEvaril mUvarAy niRkum mudhupuNarppum – Among the dhEvas, standing along with brahmA and rudhra, giving the impression to the people of the world that he is equal to the other two so as to be addressed as mummUrthi (the three forms) thus taking the first incarnation as vishNu. mUvarAy niRkum – standing as one among the three. Alternatively it could be construed as – standing as three. Even though he stands between brahmA and rudhra to be thought of as one among them, did not knowledgeable people affirm, as mentioned in SrIvishNu purANam 1-2-66 “srushti sthithyanthakaraNIm brahmavishNuSivAthmikAm I sa samgyAm yAthi bhagavAnEka Eva janArdhana: II” (it is nArAyaNa who is also known as janArdhana who creates, sustains and annihilates, attaining the names of brahmA, vishNu and Siva respectively )! mudhu puNarppum – the ancient incarnation with the name vishNu. mudhumai – ancient; puNarppu – sankalpa (will or vow). (Here) It refers to the incarnation which came about out of emperumAn’s vow. Just as emperumAn had mentioned in SrI bhagavath gIthA 4.6 “sambhavAmyAthmamAyayA” (I am born out of the knowledge of my vow), doesn’t his birth take place out of his will rather than out of karma? Since his birth is not lowly, AzhwAr refers to it with the word puNarppu (incarnation out of his vow). mudhu puNarppum – Just as it is mentioned in purusha sUktham “pAdhOsyEhAbhavAth puna:” (one of his incarnations anirudhdha incarnated himself again as vishNu), since the incarnation of vishNu is the first incarnation in this world, AzhwAr refers to this as mudhupuNarppu. mUvarAy niRkum mudhu puNarppum – just as parASara bhattar had mercifully mentioned in SrI rangarAja sthavam 2-5 “madhyE virinchagiriSam prathamAvathAra: thath sAmyatha: sthagayithum thava chEth svarUpam I kim thE parathva piSunairapi rangadhAman sathvapravarthana krupAparipAlanAdhyai: II” (Oh SrIranga! 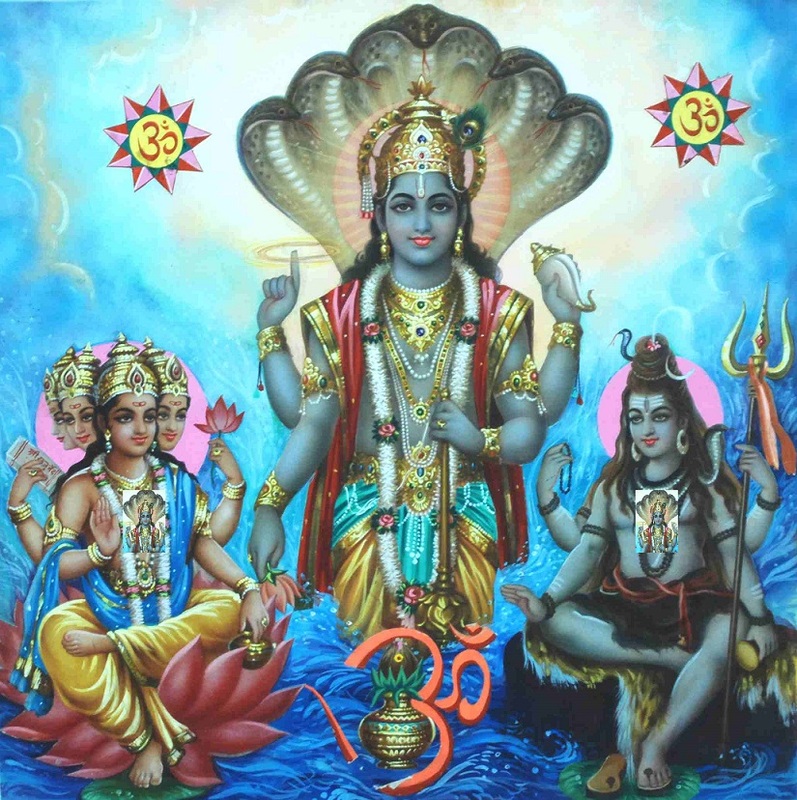 If the purpose of taking incarnation as vishNu and standing amidst brahmA and rudhra is to show equality with them and to hide your basic nature, why did you carry out the deeds of(1) exhibiting your sathva guNa (purely auspicious qualities) which manifests your supreme nature and (2) protecting brahmA and rudhra in that same incarnation?) Is it not well known that he (vishNu) is the incarnation of the supreme purusha? Is it that he only remained as vishNu, controlling brahmA and rudhra as well as their physical forms? AzhwAr says next that he also controls all entities which are sentient . . .
yAvarAy niRkinRadhu ellAm – controlling the physical forms of dhEva (celestial), manushya (human), thiryak (animal) and sthAvara (botanical) species and all the sentients who control these forms. It is implied here that there is no insentient entity which is not controlled by a sentient entity. Has it not been mentioned in SrI bhagavath gIthA 2-17 “avinASi thu thath vidhdhi yEna sarvamidham thatham” (know that those AthmAs which control all these insentient entities are indestructible)! dhEvarAy . . . . ellAm nedumAl – one of the commentators for this prabandham, SrI appiLLai construed this to mean that all the sentients such as dhEvas who are totally devoted to karma yOga, brahmA and rudhra who are considered as primary amongst them, other species such as manushya (human) etc are all the attributes of emperumAn and they are all his servitors. yAvarAy niRkinRadhellAm nedumAl enRu OrAdhAr – those who do not know that it is only SrIman nArAyaNa, who pervades all the entities which are different from himself through sentient entities giving them physical forms and names, incarnates as upEndhra and vishNu and remains as one among dhEvas and as one among the three primary deities. niRkinRadhellAm nedumAl – it is only nArAyaNa who stands as all entities and who stands amongs dhEvas and with brahmA and rudhra. nedumAl enRu OrAdhAr kaRkinRadheLLam kadai – it is not only that whatever people learn goes as wasted if they do not know that it is only the supreme being who incarnates amongst dhEvas and between brahmA and rudhra; it becomes the cause for their continuing to struggle in samsAram. It is similar to what has been mentioned in SrI vishNu purANam “vidhyA’nyA SilpanaipuNam” (all learning other than about emperumAn is equivalent to repairing one’s sandals). We will move on to the 55th pAsuram next. This entry was posted in iyaRpA, nAnmugan thiruvandhAdhi on August 11, 2018 by T N Krishnan.